November 12, 20015, Elma, WA….Well known car builder and former driver, Jerry Day, of Renton, WA, has agreed to be the keynote speaker at the 2016 EARHoF Induction Ceremony. The eighth annual induction event will move to a new venue in 2016. 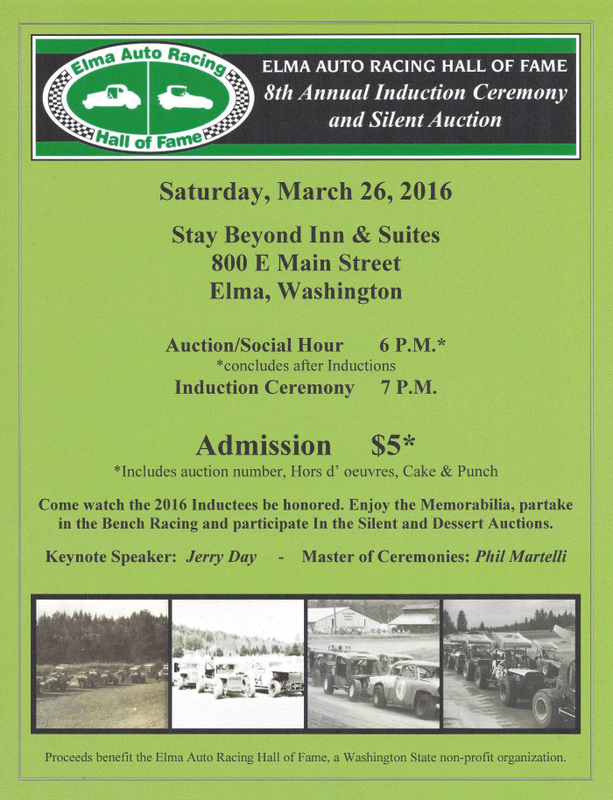 Having outgrown the Elma Eagles Hall the site for the last four years, 2016 will find the EARHoF holding their biggest event at the Stay Beyond Inn and Suites in Elma on Saturday, March 26, 2016. Day, the proprietor of RAM Race Cars Fabrication & Equipment since 1969, is known throughout the racing industry for fabrication skills, but he was also a very accomplished driver, having raced throughout the West Coast, including the major events in Elma. It was also announced by Leighty that Phil Martelli would be returning as the master of ceremonies. “Phil has been an invaluable asset for the Hall of Fame. His preparation work is second to none and he just adds an air of professionalism to anything he is involved in. Unfortunately other commitments prevent him from attending our 2015 Inductions. We’re excited to have Phil back for 2016,” exclaimed Leighty. Increased attendance each of the past three years forced the EARHoF to search for a new venue. Joining Day on the agenda of the evenings activities will be a silent auction, a dessert auction, memorabilia display, and the purpose of the event; the induction of newest Hall of Fame members. Nomination for 2016 EARHoF Inductees is open until December 31, 2015. Information about the EARHoF and nomination forms can be found at http://www.elmaautoracinghalloffame.webs.com. Also, check out the Elma Auto Racing Hall of Fame group on Facebook. The EARHoF is a 100% volunteer non-profit organization dedicated to the preservation and honoring of the auto racing heritage of Grays Harbor Raceway. The EARHoF can be contacted at elmaracinghistory@yahoo.com.